The decade of 1980 was full of great highs and deep lows for the gaming industry. In the USA alone, the arcade video game industry had generated annual revenue of $5 billion in 1981. Reaching its peak in the year 1982, the arcade video industry earned a whopping $8 billion that surpassed the annual gross revenue of both Hollywood films and pop music. The decade began with the release of the most successful video game of the era – Pac-Man. First released in Japan in May 1980, the game went on to become one of the highest-grossing video games of all times. Pac-Man Fever gripped the gamers, and the golden era of the gaming was at its best till 1983. Pac-Man is still seen as a legend among the video gamers enjoying its popularity in the form of the mobile game, on t-shirts, on backpack etc. While 1981 saw the release of one of the best ever video game created, 1982 experienced something completely opposite to it. 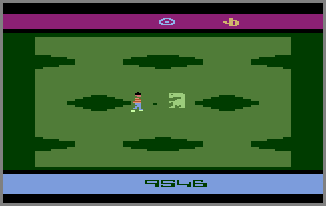 Based on the movie The Extra-Terrestrial (E.T), Atari 2600 released one of the worst games of its time E.T. It is said that the game was so bad that millions of unsold cartridges were crushed and buried in the landfill in New Mexico. Terming E.T as the biggest commercial failure of the video game industry, many term it as the contributing factor to the great crash of video game industry in 1983. The thriving industry was brought to its knees by the end of 1983. 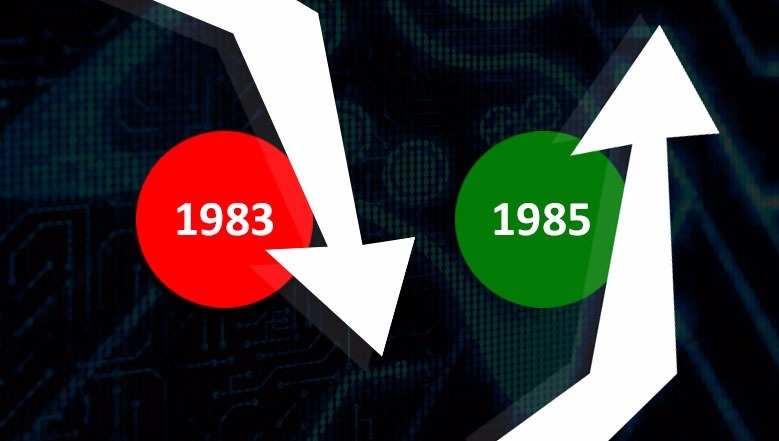 This recession in the gaming industry between 1983 to 1985 was huge with market revenue crashing down to $100 million, a staggering 97 percent fall. Many home console and video gaming console companies became bankrupt. The reason for this crash is said to be due to the over flooding of the market with low or poor quality games, the non-success of titles by Atari 2600 (namely E.T) and the emergence of home computers that provided new and advanced gaming platform. The gaming consoles that were competing against each other in 1983 were Atari 2600, Atari 5200, Colecovision, Intellivision, Coleco Gemini, Vectrex, Magnavox Odyssey II, Fairchild Channel F System and Emerson Arcadia 2001 to name few thus flooding the market with console options that was way too much than the demand. Finally, the year 1985 came and we saw the much-needed renaissance in the video gaming industry. The dust of its first financial wobble was shaken off with unusual and suppressing video games being developed by programmers all over the world. The year saw the release of 2 video games that is still enjoyed and has the largest fan following – Super Mario and Tetris. 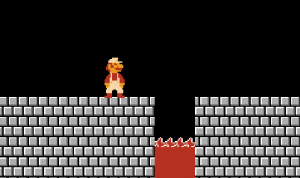 Till date, Mario Franchise has sold over 210 million units since the time of its debut. Also, in 1985, Nintendo Entertainment System decided to build their own path and go on their own way. They released a new console redesigned for a new territory, re-branded their strategy to convince the gamers that NES were nothing like the old video game consoles. NES introduced licensing terms for third party developers prohibiting them from selling their game to other console than NES. This move of NES worked thus finally ending the downfall of the gaming industry and reignited the video game market. The other launches by NES that deserves a mention are Duck Hunt, ExciteBike, Baseball and Kung Fu. When it comes to arcade video games, a total of 5 good games were launched in the year 1985; Hang On, Ghosts n Goblins, Indiana Jones and the Temple of Doom, Arkanoid, and the 4th but the best arcade game of the year was Gauntlet. Stepping into the year 1986, the year turned out to be a year of foundation for today’s many giant companies in the field of gaming and computers. While Steve Jobs and Beny Alagem were busy forming Pixar and Packard Bell Computers, gaming companies like Bethesda Softworks, Ubisoft, Codemaster and many more were being founded that revolutionized the future of gaming. The late 1980s saw the debut of third generation console where various high-profile franchises played important role in it. Naming few are The Legend of Zelda, Dragon Quest, Phantasy Star, Final Fantasy, and Square. 1987 saw the birth of the stealth genre with Hideo Kojima’s Metal Gear series’ first game, on the MSX2 computer. In 1989, Capcom released Sweet Home on the NES, which served as a precursor to the survival horror genre. Thus coming to the year 1989 the disk based computer games market was less than $300 million, while the market size of cartridge based console games grew to more than $2 billion resulting in larger gaming companies like Epyx, Electronic Arts, and LucasArts, who began to invest more time and attention into console based games. By the year 1990, Nintendo responded with its own next generation system named the Super Nintendo Entertainment System (SNES).